Though you may not have heard of him, 200 years ago the impoverished teenage poet Thomas Chatterton was all the rage. After killing himself in 1770 when he was only 17 years old, the long-dead Chatterton finally rose to fame in the 19th century, gracing the pens of Romantic heavy-hitters like Keats, Wordsworth, and Shelley. As their works illuminate, Chatterton was a precocious child, a lost genius, and a delicate soul undeserving of his harsh fate. He was also a liar and a forger. Who was this tragic poet, really? How do we reconcile his twin legacies? And why is it that a mere swindler dead for nearly three centuries still has a lot to tell us about ourselves? Chatterton’s early years were something out of a Romance tale. His father, who was also a poet, died just before he was born. The young boy then spent most of his childhood in Bristol, England locked inside his room reading and writing, or else succumbing to frequent trance states punctuated by outbursts of tears. Artists, am I right? One of Chatterton’s other pleasures was to roam around the church where his uncle worked, dreaming about the lives of the knights who decorated the altar tombs. Once, while wandering among these relics of the past, Chatterton found a series of old wooden chests and became fascinated by the medieval parchments inside them, many of which dated from the Wars of the Roses centuries before. Taken altogether, Chatterton’s poetic temperament and erratic behaviors seem harmless enough—but he was about to take a disturbing turn. Before he turned 12, Chatterton committed his first forgery. 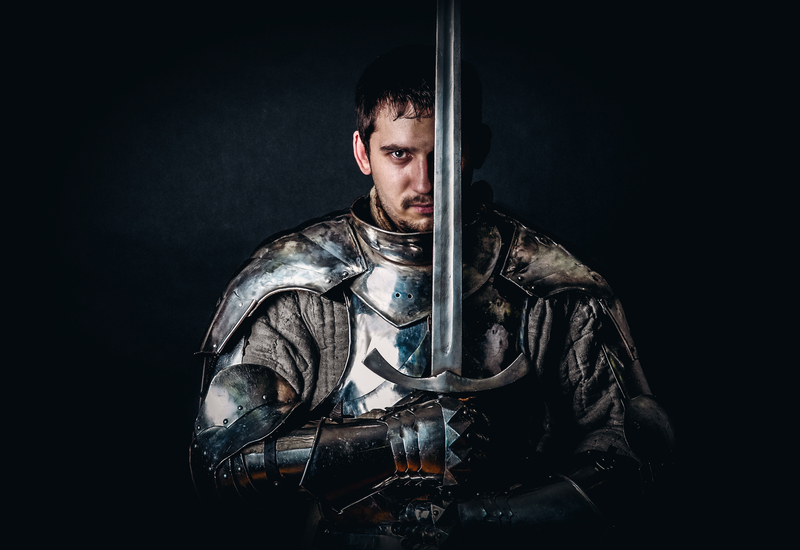 He showed a dialogue he wrote called “Elinore and Juga” to one of his school administrators, claiming it was the work of a 15th-century monk in order to lend it more importance. The text exposed the innate talent inside Chatterton, but also an inborn darkness. Soon enough, Chatterton had created a whole identity for the monk. Writing under the name “Thomas Rowley,” he began to write more romances and started to look for a wealthy patron. This patron part was necessary, since Chatterton didn’t have his own funds, but wanted to continue on the Rowley job as long as it would last. It was, however, a tricky endeavor: he had to position himself merely as the transcriber of these texts, not their author. Nonetheless, a historian named William Barrett bought the story hook, line, and sinker, later publishing his History and Antiquities of Bristol almost exclusively from Chatterton’s super fake manuscripts. But it wasn’t enough for the boy: Barrett didn’t pay well, and Chatterton skipped off to the very famous and very wealthy writer Horace Walpole instead. This was his first mistake. 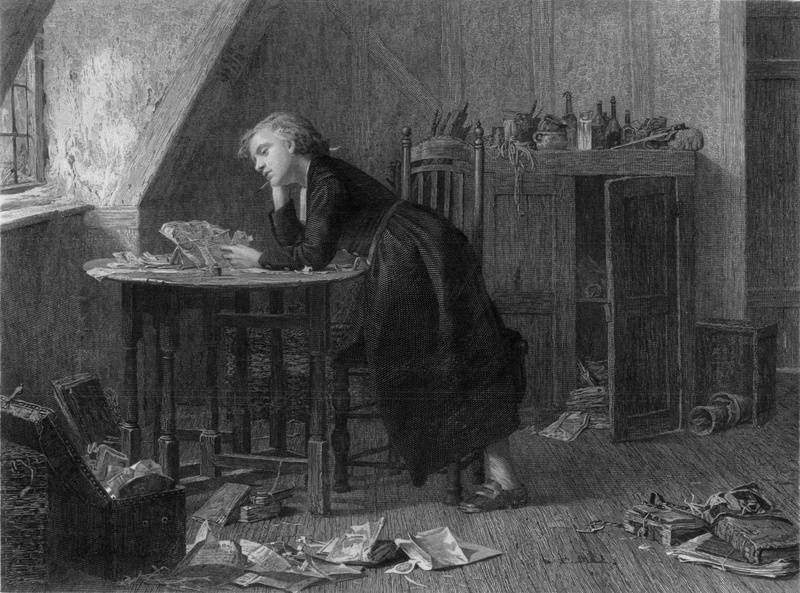 Walpole almost immediately suspected that the manuscripts the 16-year-old Chatterton promised were fakes, and sent the boy away, utterly disgusted. In the coming months, Chatterton moved to London and tried to scrape money together by writing for various magazines. Unsurprisingly, he was a great mimic, and often wrote in the scathing political style of Junius, Tobias Smollett, or Alexander Pope, all 18th-century luminaries. He even tried reviving old Thomas Rowley again, though his “manuscript” was rejected. Unfortunately, as any freelance writer could tell you, these gigs didn’t pay nearly enough, and Chatterton found himself slowly slipping into poverty. Just before his tragic, impoverished suicide, Chatterton’s life had one final, Romantic twist. 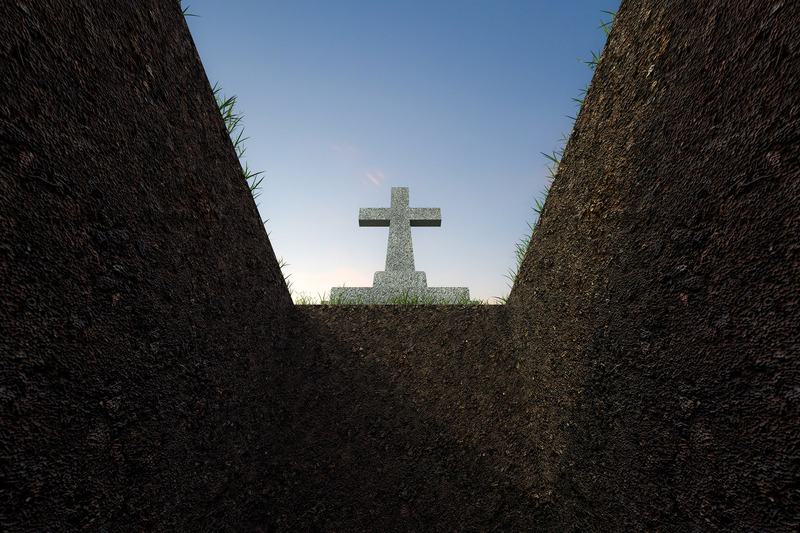 Reportedly, he was walking down a street when he fell into an unmarked, open grave. As his companion helped him out, joking about his resurrection, Chatterton commented darkly, “My dear friend, I have been at war with the grave for some time now.” Three days later, he downed a bottle of arsenic, tore up his latest literary endeavors, and died. It was an abrupt end to a short life, and Chatterton and his works seemed destined to the ignominy of forgery forever. But why was Chatterton so maligned; why was Walpole so disgusted? We know all art lies—so why do we care so much about its factual truth? This is not an original question. Almost since we started making art, humans have struggled with what it actually means, and what possible use it could have. Should it only serve a moral purpose? Are its lies dangerous? How can it possibly encompass the real tragedies of life? A frequent rejoinder to these doubts is that art is an expression of individual feeling, and is thus worthwhile as a sensitive record of human experience, via the author. Forgers like Chatterton, for all that their texts may be beautiful and riveting, throw that defense of art into a burning garbage fire. We think we’re getting a genius unfiltered, and then we find out that we’ve been conned. And the more the forged art affects us, the worse it is. How could something so fake feel so real? Suddenly, we begin to ask, what is art worth? 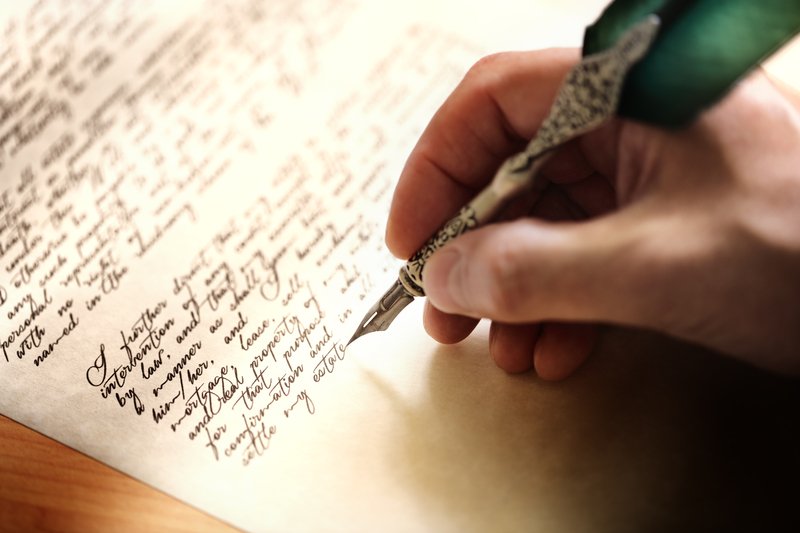 Forgeries remind us of fiction’s lie, and they teach us to distrust it rather than accept it. But individual expression is not art’s only worth. For one, there are other reasons to value art: for its own sake, as a historical record, and as a lesson in empathy, to name only a few—which may help explain why Chatterton had a second coming after all. When Chatterton was rediscovered in the 19th century, they didn’t care a whit about his lies, and he went from disgraced charlatan to glorified poetic martyr. Suddenly, the world cared about his writing, not some imaginary monk’s—even if much of that interest was tied to his tragic end. Original works about Chatterton also poured out of the era’s best minds, mulling over his talent and his brutally short life. 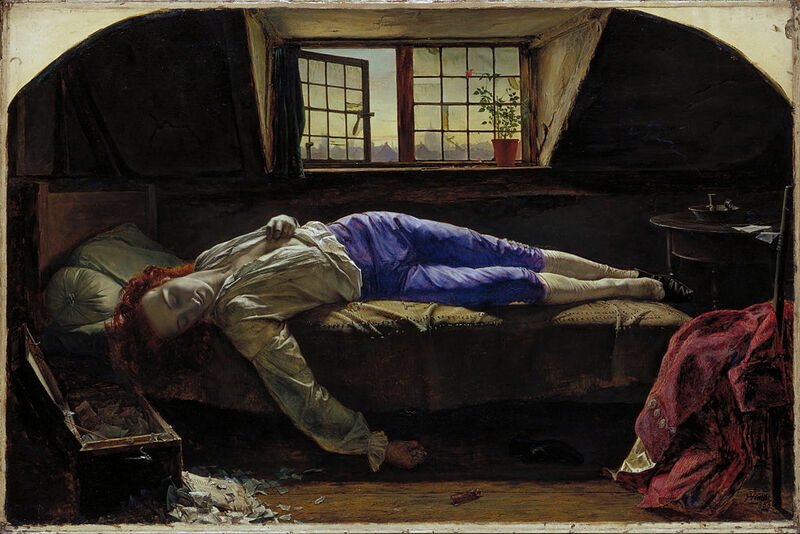 To this day, Henry Wallis’ sentimental 1856 painting of the suicide is emblematic of Chatterton’s story: it depicts the young, delicate man sprawled across his bed as if in a dreamless sleep, the tatters of his poetry lying underneath him. A genius gone too soon. But this fate came with its own flaws. Yes, this 19th-century reclamation distanced Chatterton from his infamy, revalued his poetry, and asserted his talent, honest or not. In fact, his once-shameful forgeries became part of his art, and Chatterton became more like a myth or legend than a real person. But in so doing, Romantic artists turned him into another bygone source from the days of yore to lend their own works prestige, just as Chatterton had done with the imaginary Thomas Rowley. It’s perhaps a simplistic ending. Chatterton is paradoxically transformed into a authentic poet through the Romantic fictionalization of his life, thus avoiding many anxieties about the truth or worth of art or his fakes. But this isn’t necessarily a bad thing. I’ll ask again: why do we care so much about the truth of art? Well, when it comes down to it, we don’t. We want to believe its lies.